A few team members at Waltz LTC were proud to participate in a run to benefit the Independence Association. We were also a Gold Sponsor! The Independence Association (IA) was founded by area families in 1966 to assist adults and children with disabilities in obtaining full and inclusive lives in their chosen community. Today, IA works to open new doors, push boundaries and create opportunities that encourage inclusivity and equal opportunity while celebrating every individual’s ability. The 5th Annual Run for Independence is an inclusive event that celebrates everyone’s abilities. The race allows people with and without disabilities to participate as equals in a professionally timed athletic event. Runners and families value the chance to connect with community organizations that improve the quality of life in Mid-coast Maine. Alex Lawlor – Pharm D. – Clinical Consultant Pharmacist. Thanks to everyone who came out for the event! To learn more about the Independence Association, click here to visit their website. 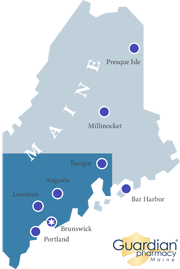 Now serving eastern New Hampshire – all areas south of Berlin and east of Nashua.